Many of our students absolutely LOVE practicing dance at home. You’ll find them twirling in the living room and tapping in the kitchen—they just can’t contain themselves! It’s not uncommon for a parent to tell us that their child feels compelled to create her own dances in the living room or teach their stuffed animals how to piqué and passé. First and foremost, Do designate a specific spot in your house that is “dance practice” space! This could be a room or hallway with very little furniture, or perhaps your garage—somewhere that is easy to move in. Don’t allow tap shoes on your easily-scuffed floors, and never allow your child to practice in pointe shoes at home (even if she has earned her shoes). Do challenge your child to practice what they remember from class, but don’t worry if they just want to improvise their own moves! Resist the urge to “teach” the dance steps yourself; Do allow your child’s dance teacher to be the authority of those skills in the classroom. 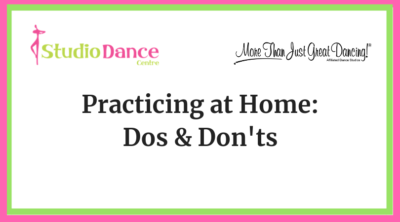 Don’t expect perfection with at-home practice; it should feel relaxed and carefree as much as possible. Do suggest that your child practice with music (any music!) since it will help them become even more familiar with finding the beat and keeping time with rhythms. Also take care to supervise when your child practices; do watch what they’re doing at home to ensure they are safe—and don’t hesitate to join in the fun! Practicing dance at home should always feel comfortable and supportive so that your child can unleash their creativity and joy for dancing. Oh, and sneak a video to show us if you can! We love seeing our students in their element at home!